Basingstoke – is it really awful? We know, it’ s just somewhere to drive past as quickly as possible on the M3. Despite a book entitled ‘Crap Towns’ calling it “a town planning travesty” it actually has a lot to offer and is still only 50 miles from the centre of London and just over 30 miles to Southampton. So you’re easily accessible to great shopping and fresh sea air! Don’t expect much from the shops in Basingstoke; the run of the mill lot are there. Not inspiring by all accounts, but a functioning high street selection, nonetheless. However Winchester is a half hour drive and has much more to offer. The choice of restaurants is limited too, but there is the usual offering of Italian, French, Chinese and Indian. If you are the type of person who doesn’t like any fuss and a weekly takeaway will do you just fine, you’ll be all right. If you like to dress up and eat out in style, there’s always the train to London (8 an hour, takes less than an hour) and you can return in the early hours (the last train is 1.05am). Basingstoke has some secrets which characterise England at its best. For example, there’s the Walled Garden, a delightful ‘secret’ garden dating back to the 1800’s, when it once served as a kitchen garden to Down Grange House. Today it operates as a public garden and wildlife area. Original features still remain today, such as the formal yew hedges, the croquet lawn and gothic gates. The Garden is an idyllic location for wedding receptions and private functions and hosts a series of popular family events throughout the year, such as Shakespeare in the Park, the Jane Austen Fayre and Celebration of Harvest. The Farmers’ Market, which specialises in local produce, regularly offers fresh flowers, second-hand books and household accessories outside the Willis Museum at the top of town. 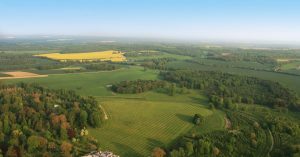 ‘spectacular down lands of outstanding natural beauty, miles of leafy country lanes and picturesque thatched cottages, village duck ponds, flower decked country pubs and historic country churches’. Well we know they would say that, wouldn’t they? 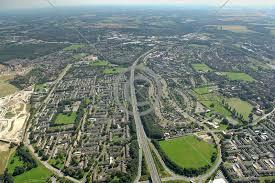 But take a look at the map; Basingstoke is surrounded by little villages. Whether you want to do the whole ‘Escape to the Country’ thing, or just have Sunday lunch in a village pub (preferably one that serves after 2pm; catches us out everytime, by the time we’ve finished the Sunday papers), the countryside is there on your doorstep. And you don’t need two tubes and a bus to get there. The Basingstoke Canal is worth a walk on a sunny evening, whilst the award winning Milestone Museum is worth a visit if you have young enquiring minds in tow (hopefully this describes you too). There are seven animal parks in the region, and worth a mention is the hilarious pig race ‘The Pork Stakes’ at Cholderton Charlie’s Farm. There’s also Highclere Castle near Newbury and West Green House Gardens at Hartley Wintney. Feeling a bit down with the English climate? Experience the wonders of a tropical rainforest at The Living Rainforest, located just north of the area. There are two private health clubs in Basingstoke. There’s Beechdown (www.beechdown.co.uk) and Fitness First. So no excuses there! How do the house prices compare? Although you can find house share lets in Basingstoke for £450 per month, most of the decent flats are more like £700-£800 per month. Compared to the average monthly rental in London, that’s not bad; you’ll have a couple of hundred pounds more to spend on yourself! To buy a flat or small house, you’re looking at around £200k. This includes lots of ‘maisonettes’. (Can’t estate agents think of a nicer word for them?) Keeping just under the £250k mark are lots of more modern 3 bed houses, such as the new style 3 storey properties. You won’t get character, but you’ll get mod cons and pleasant surroundings. If you’ve got a bit more to spend, there’s quite a lot around the £400k mark, but we’re talking detached modern executive homes; if you want a so-called character property then you will need to spend a bit more than that, depending on what you are after. If you need to consider catchment areas, check out http://news.bbc.co.uk/1/hi/education/league_tables.